As I was taking my seat at the Zellerbach Playhouse in Berkeley, one October evening in 2005, the man next to me warned me about the play that would soon start: “It’s all in Italian.” I thanked him with a smile and confessed I spoke the language. In fact, I had seen the same rendition of the play, Arlecchino servitore di due padroni (Servant of Two Masters), some years prior, when I was still living in Milan and could not miss the opportunity to enjoy it again. Supertitles helped the audience navigate the fast dialog spoken not only in Italian, but also in dialect (this video contains a short sample). I smiled and laughed according to the goings-on on stage and relished again the obvious humor and subtle irony of the comedy by beloved Venetian playwright Carlo Goldoni (1707-93). When the comedy came from a physical action, the audience laughed in unison, but when it came from a play of words or an allusion, or was otherwise dependent on the dialog, I laughed in sparse company. People not fluent in Italian had to wait for the supertitles to catch up. And sometimes the humor was culturally rooted, so the translation could not really translate it. The tables were turned just a short week later. Sitting amid an overwhelmingly Chinese audience at the performance of The Teahouse by the Beijing People’s Art Theater, I was part of the group laughing with some delay and sometimes not at all. Reading the current Cook the Books selection Animal, Vegetable, Miracle, by Barbara Kingsolver and family, made me feel a member of the audience at a play in a foreign language without supertitles. I read paragraph after paragraph and had the sense that the intent was humorous, but I did not understand what was that should have elicited my laughter or smile. In the chapter about a visit to Italy, the author mentions a prized variety of winter squash: Zucca Marina di Chioggia1. Chioggia is a city at the south end of the Laguna veneta and Sottomarina (Marina in the local dialect) is a quarter of the city. I had a gorgeous Zucca Marina di Chioggia from Organic Matters Ranch and besides making gnocchi with it (a story for another day), I made bread. 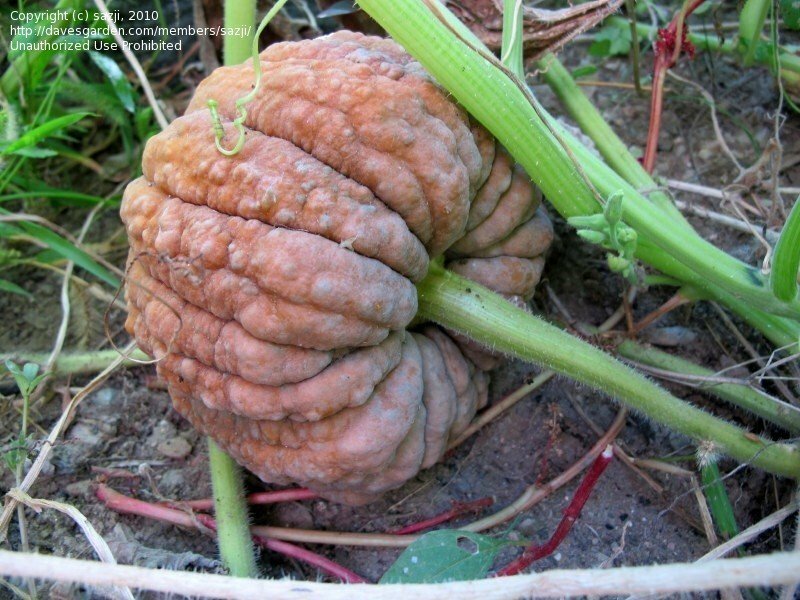 This variety of zucca is dark blue-green with a silver luster, has a flattened rounded shape with pronounced ribs and an uneven, "warty" surface. It is rather large, so, after roasting it, I got a fair amount of deep orange, thick pulp, rather dry but easily creamed when worked with a fork. The photo above was transformed into black and white using Lightroom Split Tone 2 preset. I did that because, due to the time of day I took the photo, the color was bleached, so I decided to highlight the squash's bumpy surface. The original recipe of the bread is by Dan Lepard. I made the bread three times so far, and besides Marina di Chioggia, I used Black Futsu squash and Buttercup squash, also from local farmers. The type of squash used makes a difference when measuring the liquid portion of the recipe, which is whey (siero di latte). I always use part of the whey I obtain when I make fresh cheese to make bread (according to another recipe by Dan Lepard from his book "The Handmade Loaf") and freeze at least some of the rest (that whey is not suitable by itself for making ricotta). The most recent fresh cheese I made is Quark (a story you will soon read). The original recipe makes one large or two regular loaves: I halve it to make one loaf. I also make some small adjustments, part personal preferences, part experiments. Note: I add 25 ml of whey to the quantity called for (225 ml) because of the whole-wheat flours I used. I then add 25 ml more, because the squashes I have used are drier than the drained cooked pumpkin used in the original recipe. Preheat the oven to 375 F / 190 C. If the squash is hard, pre-process it as follows: pierce it with a blade in a few places, place it on a baking sheet lined with a silicone baking mat, and bake it for 15 minutes, then let is cool slightly. This makes it easier to cut it in half. Cut the squash (pre-processed or raw) in half lengthwise and remove the seeds (a grapefruit spoon is my preferred tool for this task). Place squash halves on the silicone baking mat, cut side down. 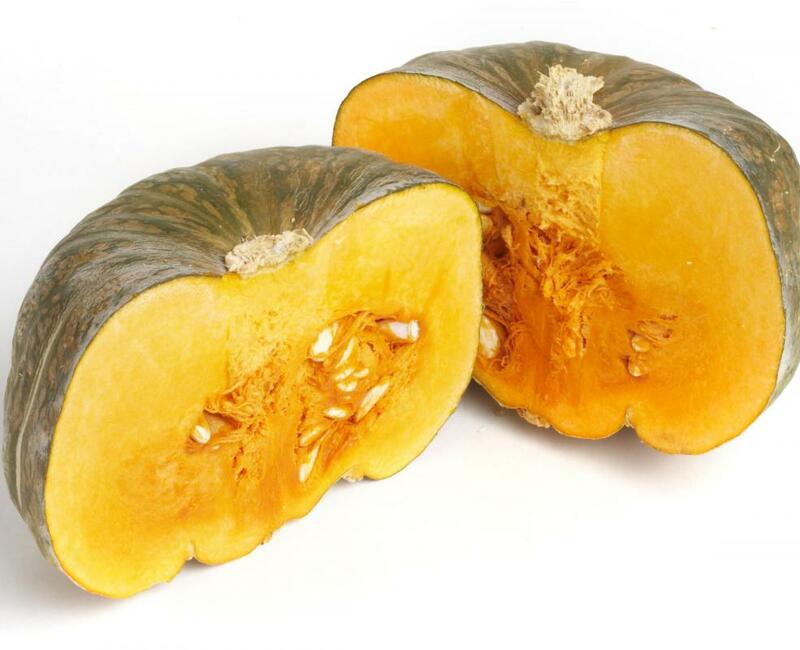 Put back in the oven and bake until squash is tender, easily pierced with a blade. Let the squash cool and then scrape the flesh off the skin, again using a grapefruit spoon. Weigh the amount required by the recipe. You can use excess squash to make this soup, a bowl of which is visible in the photo above. In her “Vegetarian Cooking for Everyone”, Deborah Madison gives instructions on how to treat walnuts to improve their flavor when they aren't freshly cracked, and make them less irritating for people who are sensitive to their skins. Bring a pan of water to a boil, add the walnuts and let them stand for one minute, then drain them and absorb the excess moisture with a towel. Finally, spread the walnuts on a baking sheet and place them in the oven preheated to 300 F / 150 C until they have dried out, 15-20 minutes. Remove them from the oven as soon as they are dry. Bake the loaf on the stone for 20 minutes at 425 F / 218 C. At the beginning, I make some steam with ice cubes. I turn down the oven to 375 F / 190 C and complete the baking at this temperature (another 20 minutes or so). Take the loaf out of the oven and place on a rack. Let cool completely before slicing. Update (11/29): after using overnight fermentation again, followed by baking in a lidded pot, as per Sally's suggestion (see her comment below), I decided to rewrite the section below to provide additional details to interested readers. Follow the instructions in the original recipe of the bread in terms of mixing, but use only 2.5 g of instant yeast. After the 10 minute rest and brief kneading, place the dough in an oiled bowl, cover (with a shower cap, plastic film or the bowl's own lid) and refrigerate. The morning after, take the bowl out of the refrigerator and let the dough come to room temperature. It will look slightly puffy. After 1/2 hour or so, place a baking tile in the oven and place a lidded 5-Qt cast-iron Dutch oven on it. Preheat the oven to 425 F / 218 C.
When the dough is ready, cut a piece of parchment paper large enough so that you can take hold of it by the corners and use them to help you lower the dough into the Dutch oven and later to retrieve the bread from it. Flip the dough onto the parchment paper, score the surface and mist the surface with water. Take the Dutch oven out of the oven, remove the lid, and place in it the shaped dough. Put the lid on and place the Dutch oven back into the oven. Bake for 20 minutes, then lower the temperature to 350 F / 177 C. After 10 more minutes, remove the lid and bake for an additional 10 minutes. The bread is done when the surface is golden and tapping the bottom will produce a hollow sound. I also checked the internal temperature and found that it was 205 F / 96 C.
This version was my favorite in terms of crumb texture and flavor, so I will definitely experiment with it further. I love this bread. It has a lovely golden crust and a soft crumb in which walnuts and sunflower seeds pop nicely. It has a delicate flavor that charms the palate. It accompanies well many foods and is happy to be eaten by itself. I am sure I will continue making this recipe throughout winter squash season. 1 In Zucca de Chioggia, "de" is a misspelling and unfortunately it is not the only one in this chapter. I am sending this bread also to the November edition of Panissimo, a monthly event created by Barbara of Bread & Companatico and Sandra of Indovina chi viene a cena? and hosted this month by Michela of Menta e rosmarino. - to the monthly showcase Sourdough and Yeast by Wisla (in Polish). This is the roundup of the event. - to Yeastspotting. This is the second part of the roundup, which includes links to the other two parts. - to Week 4 of 12 Weeks of Winter Squash by Heather of girlichef and Joanne of Eats Well with Others. or launch the pane alla zucca con siero di latte audio file [mp3].